New book, 80 pages, SS25055. For the 30 years the Saab 37 Viggen thundered over Sweden, a resolute deterrent against any potential aggression. 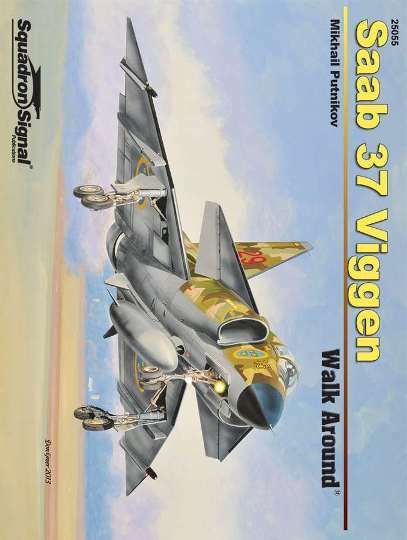 Named for the thunderclap that resounded when the god Thor banged his hammer, and developed to replace the Saab 32 Lansen as an attacker and Saab 35 Draken as a fighter, Viggen was designed as a multirole combat aircraft capable of performing fighter, strike and reconnaissance duties. Saab adopted a novel and extremely advanced aerodynamic configuration of a main delta wing combined with delta-shaped foreplanes. Viggen became the first canard-equipped military aircraft to enter production since aviation's 'stick-and-string' days. Viggen easily met the strict Swedish Air Force specification of combat operations from 500-meter runways and public roads - a performance standard that few other attack jets in the world could equal. Significantly, the Viggen was the first aircraft to be equipped with both afterburner and reverse trust. Continually upgraded during its career, the Viggen produced a number of variants, including a two-seater trainer as well as photo-reconnaissance, ground-attack, and all-weather interceptor versions, which came to an end with the last Viggen flight in Swedish military service in June 2007. This volume contains photos published here for the first time, as well as detailed drawings based on original Saab technical manuals. Outstanding among the few publications in the world devoted to Saab 37, this book will be of interest to modelers and aircraft enthusiasts alike. Illustrated with 196 photographs, color profiles and numerous line drawings.